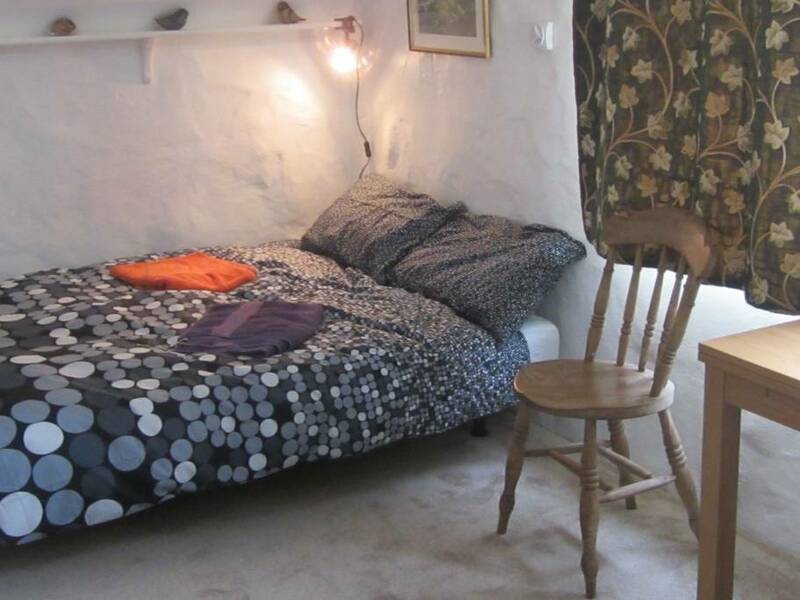 The studio apartment is the cosy upstairs part of Trefelin Fach in Cilgwyn, 2 miles from Newport. Perfect for one or two guests. 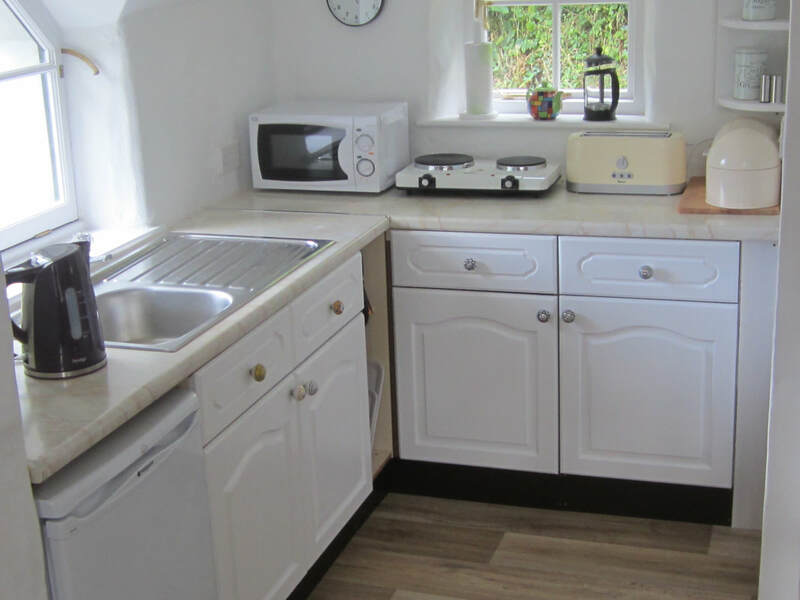 Newly refurbished, it's open plan, with kitchenette, living area & sleeping loft. There's a small bathroom with shower cabinet. The loft has two beds, but some guests prefer to use the easily adjusted sofa bed in the living room. 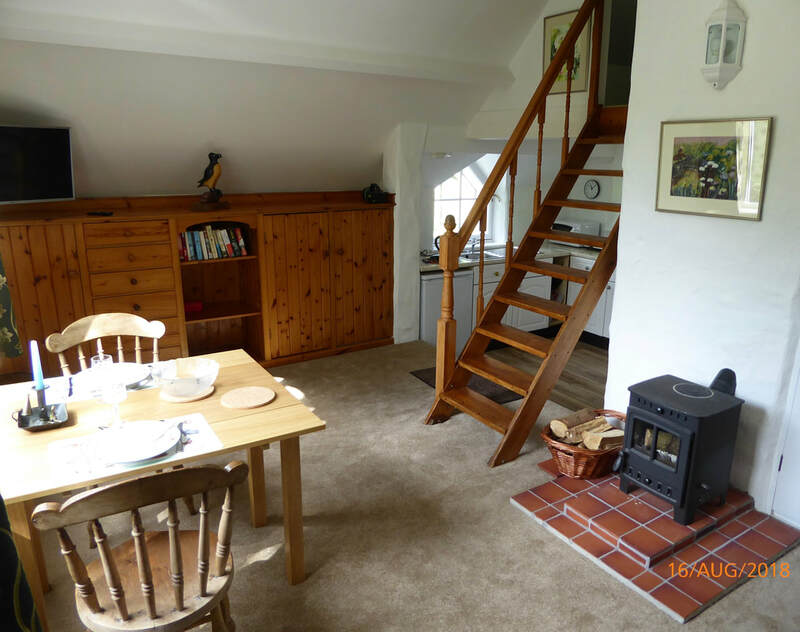 There is a wood burning stove and a fabulous south-facing arched window with a view across the Clydach valley and towards Mynydd Preseli. There is ample off-road car parking in the adjacent yard, with an automatic security light. The main dwelling house is across the yard. 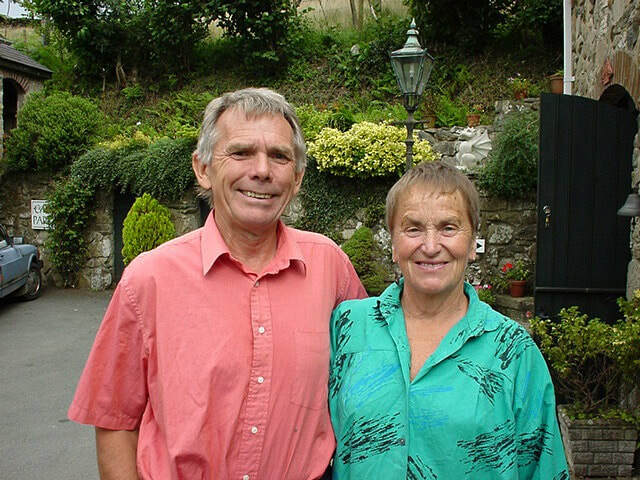 The ground floor of Trefelin Fach is occupied by the Pembrokeshire Candle Centre, a popular small business founded by Inger 43 years ago, and still going strong. One room houses the workshop, and in another room we have a small museum relating to the craft and traditions of candle-making. Opening times are intermittent, and there is very little disturbance for guests. The main workshop opening season is Easter to the end of October (five days per week), and it is closed for most of the winter. Please ring 01239-820470 to check on availability. 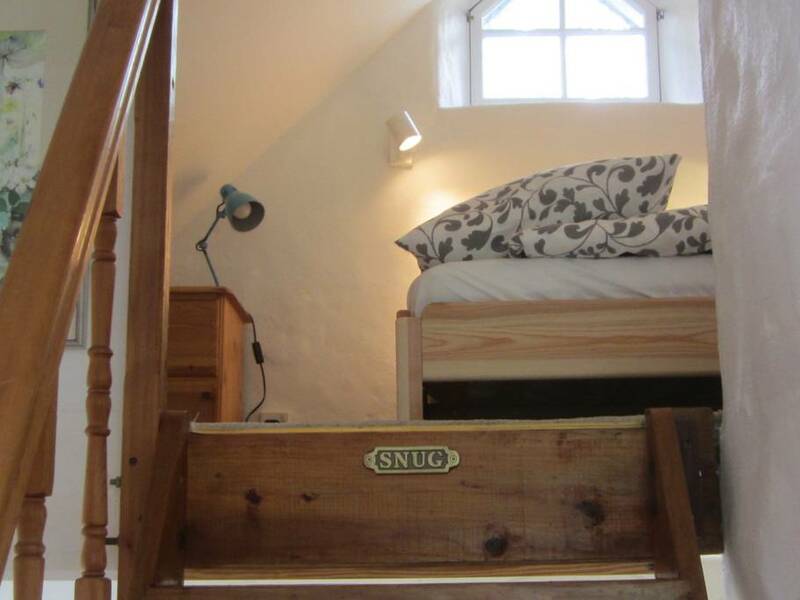 Base rate is £75 per night, with a minimum stay of 3 nights. Cleaning fee £20. A discount rate of 20% is available for bookings of 7 nights. A discount of 40% is available for bookings of 28 days or more. Free cancellation (full refund) for 48 hours. After that, cancel up to 24 hours before check-in and get a 50% refund. The nearest railway station is at Fishguard (Goodwick) -- now served by a number of trains every day connecting with London, Cardiff, Swansea and Carmarthen. From Cilgwyn there is good road road access to Newport and the main A487 road. In Newport, there's access to bus services including the Poppit Rocket which serves walkers on the coast path. Throughout the area there are abundant well-maintained local footpaths and bridle paths. The network of local lanes is also very popular among cyclists, and there are a number of designated trails, lovingly looked after by the local footpaths group. Cilgwyn is a hamlet of scattered farms and cottages, spread across about a mile of countryside and connected by a network of quiet leafy lanes. The River Clydach flows through the hamlet and under Cilgwyn Bridge. At night, in clear weather, there is so little light pollution that you can see the Milky Way. We are just two miles from the Ancient Borough of Newport, no larger today than it was in the Middle Ages. The castle is still owned by the Lord Marcher of Cemais, and it is still lived in. There are excellent inns, restaurants, galleries and boutique shops. There is a busy street market every Monday morning. Parrog, at the mouth of the Nevern estuary, used to be the port for the town, used by fishing and trading ships; it still has its lime kilns, quayside walls and a jumble of old seafarer's cottages along the sea front. Nowadays, almost all of the vessels are pleasure craft, and the Boat Club is a popular social centre particularly during the summer months. Across the river is Traeth Mawr, a vast expanse of sandy beach with safe bathing, and Newport Golf Club, with one of the most beautiful 18-hole golf courses in Wales. This is where the eight best-selling novels of the Angel Mountain Saga originated, and the house next door is the centre of Brian's rather small but successful publishing empire. If you are a fan of the novels, and want to know more about the places and the characters featured in the stories, Brian will be very pleased to help. Inger was one of the earliest "cottage craft" producers to settle in the Newport area, and while most of the others have long since ceased trading, she battles on. The workshop is open on five days per week in the summer, and Inger is always happy to show guests some of the secrets of the candle-maker's craft. A very warm welcome to you! We hope you will have a wonderful stay. 1. The hot water should be on. If not, open the cupboard door to the right of the wood-burning stove and switch on the heater. The other switch is for the heated towel rail in the bathroom, and should be on already. 2. TV and Wi-fi are available for guests. If you have any problems with either, please let us know and we will be pleased to help. 3. There is a picnic bench across the river in our extra parking area. Feel free to enjoy our meadow and to wander in the wood -- just ask us for directions. It can be muddy! 4. The wood burning stove is generally quite adequate for keeping the apartment warm if the weather is cold. We keep an ample supply of logs and kindling in the black box by the door and in the woodstore behind the apartment. (Use the shortest logs because the firebox is quite small.) There are also two electric heaters for your use, should you need them. The fire is easy to light with paper and kindling -- if you have problems, just ask! 5. Please be mindful at all times that the stairs up to the sleeping loft are quite steep. 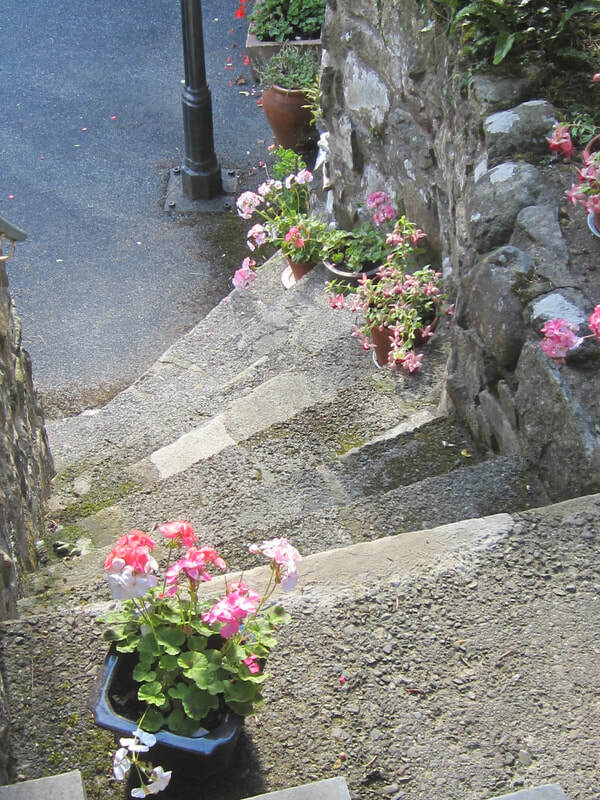 To avoid any possibility of slipping, please face the steps at all times, whether going up or coming down. 6. Extra blankets and pillows are kept either in the cupboard beneath the TV or in the top cupboard to the right of the woodstove. 8. There is a green compost bin under the sink for food waste, peelings etc. Please use that -- all green wastes go into the compost bins in the garden. 9. If you need extra chairs (for example, if you invite guests in for a meal), just ask us! Happy to oblige. 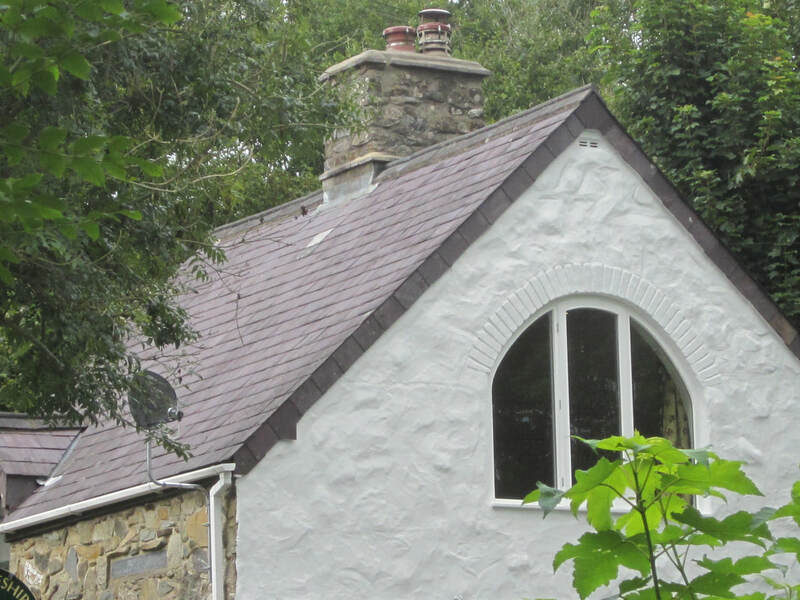 Nearby beauty spots include Carningli (locally called "Angel Mountain"), Tycanol wood, the Pembrokeshire Coast and the wide skies and moorlands of Mynydd Preseli. Nevern Church, just a couple of miles away, is a haven of serenity, famous for its "bleeding yew trees" and its massive carved Celtic Cross. A few miles further along the A487 road is the reconstructed Iron Age "village" of Castell Henllys. There are ancient monuments galore, including Pentre Ifan and Carreg Coetan cromlechs, Iron Age hillforts at Garnffoi and Carningli; and single standing stones and other stone settings from the Bronze Age. Just ask for locations. Among our other attractions: the tors of Carnedd Meinbion Owen, on the hillside above Cilgwyn (within easy walking distance); the award-winning gardens of Dyffryn Fernant, not far from Dinas; the Penrallt garden centre near Moylgrove; Ceibwr and the Witche's Cauldron, displaying Pembrokeshire coastal scenery at its most dramatic; the old slate quarry and Tafarn Sinc (a corrugated iron inn) at Rosebush, on the other side of the Presely montain ridge; and the ruins of a little church in the pretty cove of Cwm-yr-Eglwys. But if rushing about is not your thing, why not simply wander around the Cilgwyn lanes (which are sheer technicolour magic in the month of May) or stroll on Carningli common? You can wander freely across the mountain, although the lower slopes are bracken-covered during high summer. But you will probably have the mountain all to yourself -- apart, that is, from the mountain ponies, the sheep, the skylarks, the ravens and the buzzards. The Newport - Cilgwyn - Carningli neighbourhood has gained a certain notoriety in recent years because this is where Brian's best-selling "Angel Mountain" novels are set. Fans of the series enjoy hunting for some of the locations where key episodes in the life of the heroine Martha Morgan took place -- at least in the author's imagination!! In the grand traditions of literary tourism, the area is now designated as "Martha Morgan Country", and there is a designated web site which describes in much more detail the landscape, history and traditions of the area.